Summer bouquets for a stunning wedding range from modest and delicate to bold and vibrant. Wedding bouquets can be created in various sizes highlighting summer colors in a variety of blooms. Wildflower bouquets are popular with casual midsummer brides because they evoke the heart of the season and produce different colors and textures. Wildflower bouquets are also very affordable, and fortunate brides may be able to pick their own bouquet on the morning of their wedding. 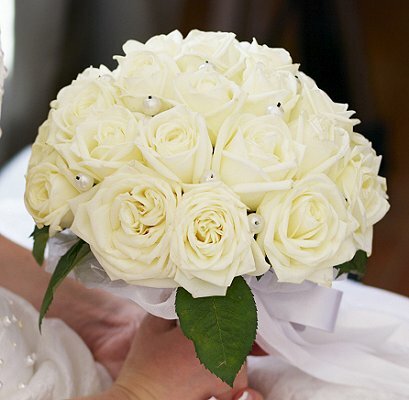 Classic rose bouquets are popular with brides in any season. A summer rose bouquet can be just one color or several colors, and they are often framed with lush greenery. A halo of baby's breath or other small flowers gives the bouquet delicacy and sweetness. Rich tropical flowers are popular in summer bouquets. Lilies, orchids, and other exotic blooms give a bouquet a unique look that still coordinates with the summer flowers all around. Lavender is a fragrant summer flower that can be used in a simple hand-tied bouquet by itself or added to a larger bouquet as filler and texture. This is the perfect choice for a bride who wants unique colors and flowers in her wedding bouquet. Orchids are another tropical flower that is popular in summer wedding bouquets. The unique shape of the flower and the wide range of colors it is available in make it a versatile choice that will still have an exotic feel. Hydrangea and daisies are two popular summer blooms that come in many shades to coordinate with any wedding palette. Pale blue and white flowers are a fresh, sweet option for a morning or early summer wedding, while bolder, stronger colors are more suitable for afternoon weddings deeper in the season. Add a tropical touch to your summer wedding bouquet by incorporating unique greenery and plumeria blooms. This is a perfect design for a casual beach wedding bouquet that has a distinct summery touch. Boldly colored bouquets stand out beautifully against white wedding dresses. Brighter colors are popular in the summer, and rich reds and pinks give a romantic hue to any summer wedding flowers. A unique option for a summer wedding bouquet is to create a large arrangement with blue wedding flowers. This type of bouquet will stand out among summer colors, and it can serve as the bride's "something blue" at the same time. While white is one of the most popular colors for summer wedding flowers, white blooms can look washed out in the bright summer sun. Add a burst of color to your bouquet with calla lilies or other blooms in bold hues such as yellow, pink, purple, or red, and coordinate the shade with your bridal party dresses or other wedding colors. Flowers are rich and lush during the summer months, and your bridal bouquet can mimic that natural growth with a thick cascade of colorful blooms. Use some greenery to break up a large bouquet, or choose variegated flowers that will show different hues from different angles. Sunflowers can be simply wonderful for a wedding bouquet. These large, affordable flowers come in a range of colors and sizes, and carrying just a few bold blooms is perfect for a casual garden wedding or summer country wedding theme. Unique bouquet shapes can help your wedding flowers stand out, and arranging roses into a bridal fan is a whimsical and appropriate choice for summer. Add baby's breath or ferns along the edges of the fan for more delicacy, and carry it as you would an arm bouquet. Many wedding bouquets incorporate a bit of greenery as a border or backdrop to the flowers. Summer greenery may include delicate ferns or trailing ivy reminiscent of nature's growth during this beautiful season. Better still is to choose greenery that coordinates with the gardens or landscaping near your wedding location for a themed look. Brides in late summer may wish to incorporate a touch of fall color into their wedding bouquets with orange or yellow blooms. Keeping plenty of white and green in the arrangement, however, ensures that it still has a summery touch perfect for the latter part of the season.